Chloe Moretz wears a fashionable Dolce & Gabbana dress with braided up-do to the 40th Saturn Awards where she received the award for Best Younger Film Actress. For the first time in the history of the Saturn Awards, Young Actors in the genre were recognized in the awards ceremony. The Academy of Science Fiction, Fantasy and Horror Films held their annual event, The Saturn Awards, this year being the 40th installment. More than 500 film and television professionals and fans attended. 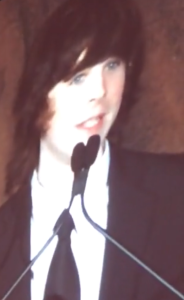 A Screenshot from footage Chandlers family took of him at the Saturn Awards, accepting his award for Best Young Performer in a TV Series. The 2 hour ceremony held at the Castaway Starlight Ballroom, honored the best in genre entertainment. This year’s event was hosted by comedian Jeff Ross, who flew in from New York to be a part of what has almost become tradition for him – hosting the Saturn Awards the last eleven of twelve years. The big winners for the annual event included Gravity which received five Saturn Awards. Marvel’s Iron Man 3 was awarded with 3 Saturn Awards including Best Actor (Robert Downey, Jr.) and Best Supporting Actor (Ben Kingsley), and receiving the inaugural award Best Comic-to- Film Motion Picture. Also receiving 3 awards was Spike Jonze’s Her (Best Fantasy Film, Best Writing, and Best Supporting Actress – Scarlett Johansson). Television was well represented with both Breaking Bad and The Walking Dead each receiving three Saturn Awards apiece. Hannibal walked away with 2 major awards including Best Network Television Series (tied with NBC Television’s Revolution). 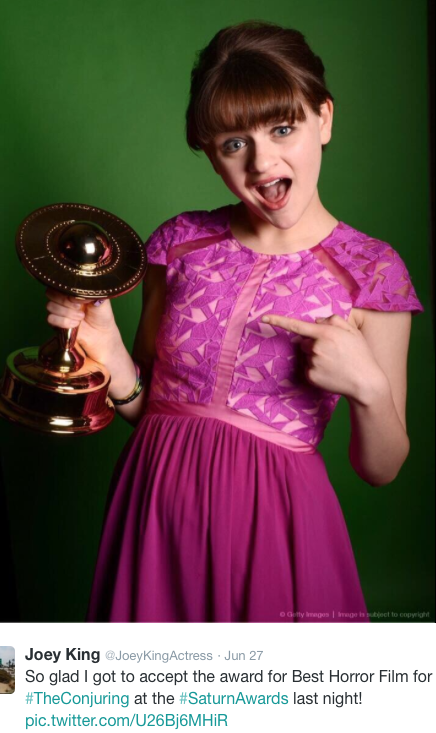 Joey King accepted the award for best horror film, her starer The Conjuring, at the 40th Saturn Awards looking smart and sweet in a bright pink dress and striking updo. Source: Joey King’s instagram. Special Saturn Award recognitions went to writer/producer Bryan Fuller who received The Dan Curtis Legacy Award which was presented to him by singer/actress Kristin Chenoweth. Greg Nicotero was recognized with the George Pal Memorial Award and Marc Cushman earned the Special Recognition Award for his books, (Star Trek) These are the Voyages: Season 1 and 2. The Life Career Award was presented to Malcolm McDowell for his rich career in acting. His best roles include Stanley Kubrick’s A Clockwork Orange, and Nicholas Meyer’s Time After Time. Following the historical event, guests mingled in the courtyard of the Castaway and were able to view the planet Saturn in the sky courtesy of telescopes provided by Celestron Telescopes Company. The show was directed by Steven Carter and produced by Kevin Marcus, Bradley Marcus, and Aaron Griffith. The Executive Producer was Robert Holguin, who is the President of the non-profit organization.